As mentioned earlier this year, we don’t showcase our videos very much. The primary reason for this is that by the time most of these films were digitized, they had already begun deteriorating. Colors have saturated and most of the images aren’t very crisp. 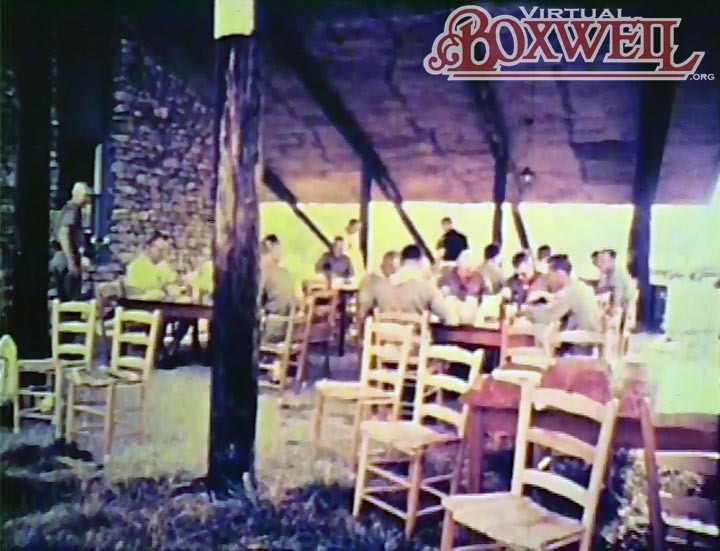 In short, while the videos all contain important Boxwell history, they aren’t really great images. Nevertheless, this week’s image comes from the 1967 promotional film. The scene this week is a Scoutmasters’ Supper. Just a few seconds earlier in the film, Ward Akers himself is cooking steaks on a tiny little round Weber-like grill. And while that would have been a nice capture, this scene has more to point out! First, notice that this supper takes place not at Fehrmann (or Akers’ Cabin or Ittabeena or whatever you call it), primarily because it wasn’t built yet! The supper is instead up at the Crab. Notice there is no concrete slab yet and the tables are all the square tables. For those who worked in 1970s through 1990s, you’ll note that there are no pay phones yet at the Crab (they’re gone again by the way). Also note the intriguing electric light hanging from the ceiling. It isn’t a great picture to be sure, but it shows a much simpler Boxwell than currently exists! A Scoutmasters’ Supper held at the Cripple Crab. Ward Akers cooked the steaks himself.